As per team tradition, the Packers select game captains each week. Today’s captains will be WR Jordy Nelson (offense), CB Tramon Williams (defense) and P Tim Masthay (special teams). 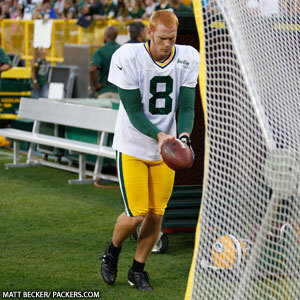 When the Packers surprisingly cut Jon Ryan following training camp in 2008, the search for a punter was on. For the next two seasons, Derrick Frost and Jeremy Kapinos held the job, but barely. In 2010, Tim Masthay and Chris Bryan competed for the position in training camp, with Masthay emerging as the winner. There likely won’t be another punting competition in training camp anytime soon, now that Masthay has signed a multi-year contract extension. He has been the Packers’ punter for the past two seasons and has done nothing but improve, which has obviously been noticed by GM Ted Thompson. “What was impressive to me was his continued growth,” Thompson said in a briefing with reporters on Tuesday, discussing the decision to give Masthay a long-term deal. “He didn’t stop with just winning the job. He wants to be really good, and he works at his craft. He’s extraordinary in the strength and conditioning portion of our organization, and we’re glad to have him. Thompson also likes what he has seen so far in the transition to veteran center Jeff Saturday, who was the most notable free-agent signing in the offseason. The Packers needed a center after Scott Wells signed with St. Louis, and Saturday was brought in after more than a decade as Peyton Manning’s QB in Indianapolis.